"Individually we are a drop; Together we are an ocean"
Ethan Racing comprises of a team of engineering students who seek to enhance the learning experience of the student community at the prestigious Vidyavardhini's College Of Engineering and Technology (VCET), by implementation of engineering fundamentals within the context of building VCET’s own formula style race car. To design cost effective cars, year after year, that are high in endurance and simple in design, and to test them for racing conditions. To establish ourselves as a successful team in the annals of Formula Bharat. To use Formula Bharat Competition as a stepping stone towards Formula SAE and represent India at an international level. Every year the team designs, manufactures and tests a formula race car prototype from scratch. 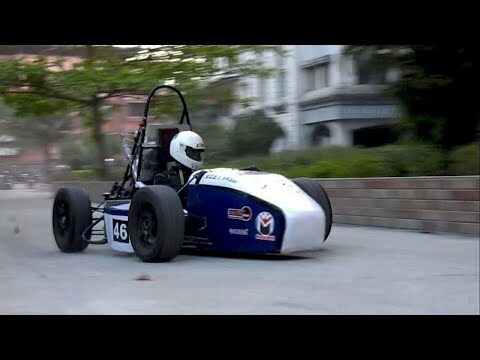 What makes this project unique is the fact that the car is totally conceived by engineering students within the college premises. The team is divided into groups representing the various subsystems in the car like chassis, suspension, engine, etc. And each sub team takes responsibility of their subsystems and ensure the design and manufacture of reliable and optimized components. Thus finally culminating in assembly of the car and testing for performance. This season the team will be participating in Formula Bharat 2018,which is an engineering design competition in which students from colleges and universities all over the country, compete with a life-size Formula-style car in areas of engineering design, overall cost, marketability and dynamic performance. Formula Bharat is an engineering design competition in which students from colleges and universities all over the country, compete with a life-size Formula-style vehicle in areas of engineering design, overall cost, marketability and dynamic performance. The series replicates the global Formula Student series hosted in around 11 countries per year. HOW THE CONTRIBUTION WILL BE USED? Being engineering students it becomes difficult for us to generate all of the funds to complete the car. But with your contribution we'll be able to raise a part of that amount. Thus to have a better outreach and also to educate the masses about unique projects like ours, we have chosen to crowdfund. Every bit of everything needs different resources to grow at its pace and more the resources faster the growth. We seek your resources to make it valuable in form of VCETs own Formula-style car, of which you will be a proud contributor. WHAT ARE THE RISK AND CHALLENGES ASSOCIATED WITH THE PROJECT? With high hopes and continuous hard work, the team is working day and night to achieve the dream that they have imagined. But the challenges and limitations that the team face are in terms of final resources that will help us represent ourselves successful on the platform provided to us by FORMULA BHARAT event. Lack of funds often lead to compromising during the manufacture of the car, which inturn leads to the design not being full realized into the final product. Your valuable contribution will help us tackle this obstacle easily. WHAT HAPPENS IF WE DON’T RAISE THE MONEY? This campaign is all about everything. We are on course to getting our car ready for Formula Bharat 2018 with the design phase already underway. We need your contribution to proceed with the manufacturing phase of the car; and if we are unable to reach the target mentioned we will still keep on trying harder to get the resources. Obviously it will take us longer to generate the funds, thus also affecting the team morality and the car will not be up to the mark. So, please come forward with your contribution and help us make one of the top cars in India. Your share could be as good as a donation for ETHAN RACING! Not everyone can afford to take care of their loved ones. ETHAN RACING's life can only be saved by donations made by kind people like you.